A State Labor Government would replace the Rawson Rd level crossing if elected in March next year. Member for Gosford Ms Liesl Tesch said she did not need to be pressed to make the commitment. “It is something we would like to deliver in this community,” she said Ms Tesch said she believed Central Coast Council staff were in the process of writing to her seeking her commitment to deliver the Woy Woy level crossing replacement project if elected to the Government benches next year. She said she did not feel the need to wait for the letter before informing Council and the public that she would make a commitment to deliver the project. Ms Tesch said she expected some of the cost of the project could be borne by the Federal Government. She referred to a recent joint State and Federal Government announcement to examine how to deliver a faster train service. “I would think the Liberals will be investing at a Federal level as part of their business case for making the train trip between here and Sydney a faster one,” Ms Tesch. 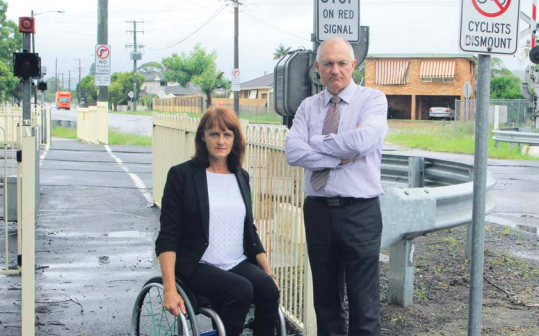 “They don’t need to spend $20 million on investigating options to know this level crossing should go,” she said. Cr Richard Mehrtens said he was hopeful that both major parties would commit to funding the Rawson Rd level crossing replacement as part of their election campaigns. “It is less than 12 months until the next state election and the Government and Opposition will be putting together their promise packages together, so I hope letters from council staff are being sent to both asking for their commitment,” Cr Mehrtens said. Council staff were also working on a reassessment of the costs of the project, he said. He said the “whole back and forth” between Council and the State Government before the project was canned in 2016 had been about costs, scope of the project and outcomes. “What we need to do is get back to basics on what the project will look like. “Will it be further up Woy Woy Rd or close to where rail crossing is now? Deputy mayor Cr Chris Holstein said he believed Council needed to meet with the Government and the Opposition to make it happen. “It is currently with Council officers to make those representations and it is up to the mayor and general manager to put together those representations but I would expect it to be in the form of a delegation for meetings with the Parliamentary Secretary for the Central Coast and the Member for Gosford,” Cr Holstein said. Cr Holstein said the future of the Rawson Rd crossing replacement project was the key to fixing the Peninsula’s growing east-west traffic problems. “I am still keen about addressing the problems with vehicular movements east-west,” he said. “I still think the Peninsula has major issues around east-west traffic movement but it is all dependent on making the alternate route through Woy Woy Rd to the freeway open up and safer and that was all going to be a flow on from the underpass. “It sits in the bailiwick of the level crossing and we have got to keep reminding the Government that we need infrastructure,” he said. This article appeared first in The Penisula News print edition, Monday, March 23, 2018. Find more stories about this issue here.